This article by American aviculturist Ed Moat was first published in the Parrot Society magazine Volume 51, February 2017. Following on from Hayley Baker's article Parrotlets for Beginners, this piece expands on the genetics of creating mutations, and the perils of continued inbreeding. This should prove interesting and of benefit to anyone involved in producing mutation colours of all parrot species. Ed Moat writes - Lately, there has been a great deal of disagreement regarding just exactly what is an example of a normal green Celestial parrotlet. Before I begin to discuss the confusion, I think it is necessary to explain the importance of the normal green in a breeding program. A normal green Celestial parrotlet is a bird free of genetic colour mutation splits. These birds can be confirmed by producing lineage from a bloodline free of colour mutation over a series of generations. Why is it important to produce these normal greens? Because it is the genetic lineage of these birds that essentially "reset" a bloodline. As mentioned in so many publications, colour mutations are genetic defects. Just look up the meaning of the word mutation in the dictionary. These genetic defects can not just alter plumage colour, they can alter functioning of metabolic health (failure to thrive), diminish cardiovascular and autonomic systems, and also decrease body mass (size.) Over the years of producing colour mutations, many breeders are now reporting lower fertility rates. The importance of producing normal greens that are free of mutation is to outcross back into a bloodline of colour mutation in order to restructure what colour mutation has diminished. A normal green should be outcrossed into a bloodline every 2-3 generations in order to maintain size and vitality. That all seems pretty cut and dried. So why all the confusion? I personally feel that it is due to the labelling that some breeders give normal greens. Normal Greens are frequently labelled as 'Clean Greens' or 'Wild Greens'. Many novice breeders and potential pet families will mistakenly perceive the labelling of the 'clean green' as meaning that these birds are free of disease or illness. Although the experienced breeder understands the rationale of the labelling, it sends the wrong meaning to the general public. It may also inspire a negative connotation within the public eye when it comes to breeding parrotlets. Labelling Normal Greens as 'wild greens' also sends the wrong idea. The only birds that can truly be labelled 'wild' are those that have been imported into a country directly from their wild regions of origin. Birds that hatch in aviaries are far from being 'wild'. Therefore, I feel 'normal green' is the best terminology. "Wild Greens do not exist in captive breeding programs" is a true statement. As I mentioned above, only birds that have been imported in from their natural habitat can be termed wild. Those of us that breed normal greens have never claimed that we are attempting to breed back to the wild form. However, the normal green birds being bred in our programs are the closest genetic examples to parrotlets found in the wild. They are not mirror-image, but they are the closest to the nominate race that are available in most captive breeding programs. Fundamental genetic practice claims when working with mutations that you must outcross back to the nominate of a species to restructure a bloodline. Hence, the normal green that has been confirmed over generations by not producing mutations. "You can't guarantee that a bird will never produce a genetic mutation" Is also a true statement. A gene can mutate any given time, however, it is the controlled environment that governs if a mutation bloodline is set. "So why even consider attempting to produce normal greens if you cannot guarantee that a line can't mutate?" I can answer this question only with my own opinion. As mentioned already, correct genetic rationale describes a mutation as a defect. If we breed defect to defect, we essentially produce another defect. A bird that is a visual colour mutation, or a mutation split for other colours, carries genes that can harbour congenital defects that can be passed to future offspring. I would feel more confident outcrossing with a bird that has been confirmed over generations to be free of mutation than to breed an unconfirmed bird with possible unknown splits. Even worse would be breeding a bird coming from multi-generations of improper colour mutation line-breeding. So basically, I am selecting what I can substantiate through my own breeding program as the healthiest bird to use when restructuring a bloodline. And how can I confidently select these birds? By using birds that have not produced a colour mutation over several generations of selective breeding. These birds exist in a few aviaries here in the United States. Find a reputable source breeder, and then work on your own bloodline over generations. I am more a person to confirm on my own turf. Therefore, birds are confirmed in my aviary before I introduce them for restructuring. "What if a Confirmed Normal Green is not available?" If a Confirmed Normal Green is not available, then the next best bird to use in restructuring would be a Confirmed Green Split. At no time should it be acceptable to breed a bird with unknown splits if you are attempting to maintain a strong bloodline. "I have never had a problem breeding mutation to mutation. Proper Genetic Pairing is just a concept dreamt up by breeders that are attempting to convince the public that their breeding practices are superior." I have lost track of how many times I have seen this statement in bird forums, with breeders claiming that proper genetic pairing is a farce. That their birds 'look' fine. Another proven truth in genetics is that not all congenital defects are visual. But, also the fact that a defect does not necessarily present itself at birth. It can manifest over the period of an individual lifespan or even after several generations in a bloodline. Geneticists, Veterinarians, and Biologists alike agree that the perpetual manipulation of a genetic bloodline by mutations diminishes a species as a whole at its genetic core. Not only does it alter the species' genetic make-up, but it also amplifies congenital defects that reduce the health of a species over time. The importance of proper genetic pairing is not species specific. It applies in all breeding programs where genes are being manipulated to produce a subject that is altered from its normal state. Therefore, it doesn't just apply to parrotlets. Here is a perfect example of a congenital defect bred into a bloodline over time. Many improperly paired Lutino cockatiels manifest a bald spot at the top of their head. This is caused from pairing two recessive mutation traits (Lutino to Lutino), thus altering feather structure in birds being produced. In order to remove this defect from a bloodline, one must pair these birds with a normal grey, (which is the nominate of the species). This process may take a few generations to completely remove the defect from a bloodline. Ask any experienced breeder about the importance of properly pairing lutino, fallow, and albino birds. I am quite certain that you will find that they all agree that breeding red-eyed birds to red-eyed birds greatly increases the chances of babies being born blind. These are just two examples of congenital issues that manifest in birds that are improperly paired. There are many other defects that could be added to this list. That being said, how can anyone confidently dismiss the concept of proper genetic pairing when it comes to the correlation with congenital defects? The fact that very few breeders are line breeding to produce Confirmed Normal Greens limits the number of specimens and bloodlines of these truly 'rare' birds. Therefore, inbreeding of related bloodlines is of great concern. It is clearly evident that if a breeder is not taking the necessary steps to ensure that birds are not related, then inbreeding of related birds will eventually occur as bloodlines diminish. And with the perpetual inbreeding of a species over time, the eventual destruction of the line is evident. Thus, producing congenital defects will affect the over-all health and vitality of the bird. It can also affect fertility - we are undoubtedly starting to see a decline of fertility in parrotlets. Many pairs have presented a decline in fertile egg production over the last twenty years. Where birds use to produce up to 8 or more eggs, we are now seeing them average 4-5. 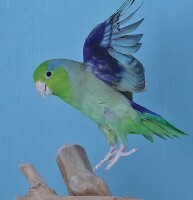 It is still possible to import and export colour mutation parrotlets. Unfortunately, the process can be very time consuming. And I personally feel that it places the birds under a great deal of stress. In my opinion, it would be best to seek out new bloodlines in your region. Importing and exporting birds can be considered in circumstances where bloodlines have been exhausted and a species or bloodline is limited in a region. Import and export is one way - but not the only way - of restructuring bloodlines. How can we ensure that we are producing quality bloodlines? It doesn't happen overnight. You have to confirm lineage over a series of generations. It takes a serious breeder willing to invest the time, money and effort in confirming lineage - i.e. DNA testing to eliminate inbreeding; proper veterinary care and testing to ensure health. A breeder cannot confidently confirm a bloodline that doe snot have a proper lineage background recorded. If you cannot relay the lineage, you cannot guarantee a healthy bloodline. However, you have to start somewhere. Therefore, unconfirmed birds should be 'restructured' by pairing with normal greens. And then produce your own splits. And over a series of generations, you can develop a bloodline that you can be proud to confirm as a quality. Over the last few years, aviculture is beginning to realise the importance of the breeding of nominate species. Parrotlet breeders have known for years that normal greens are necessary in maintaining bloodlines. In the last year, more and more parrotlet breeders are developing an interest in producing these normal green birds. Along with Parrotlet Warriors (a FaceBook group focused on Normal Green Celestials) the Lineolated Parakeet Society is developing a group which focuses on maintaining healthy bloodlines of normal green Lineolated parakeets. More and more breeders are embracing the importance of out-crossing colour mutations. But most importantly, they realise the true beauty of the original colour green. The green birds are the structured base to many species. As these green birds become more and more difficult to find, the removal of the 'base' to the bloodline will cause the line to diminish and possibly collapse. If this happens, we may be left with specimens of birds that are quantifiably inferior to their wild ancestry.